We are appreciative for articles and reports which draws attention to a quiet part of America art history and our efforts in researching the Civilian Conservation Corps and the New Deal CCC art program. “Traveling History’s Trail . 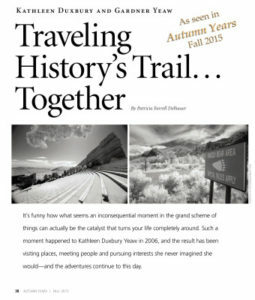 . . Together” written by Patricia Farrell Delhauser along with the design and layout by Heidi Gross appeared in Autumn Years magazine. The Living New Deal, an organization whose goal is to inventory, map, and publicize the achievements of the New Deal and its public works across all fifty states recently featured “The Lost Artworks of the Civilian Conservation Corps” and other CCC articles on their wonderful interactive and expanding website. 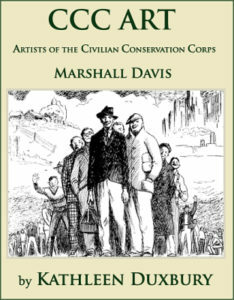 CCC ART – ARTISTS OF THE CIVILIAN CORPS – Marshall Davis is a deeply researched and factual narrative of the CCC art program. Drawing on the prolific and candid illustrations of a young, untried artist the life and work of the CCC, the greatest conservation movement in American history, is easily understood and comes to life through the art of Marshall Davis. Available: My website KathleenDuxbury.com; the New Deal Store at the Franklin D. Roosevelt Presidential Library and Museum and Amazon.